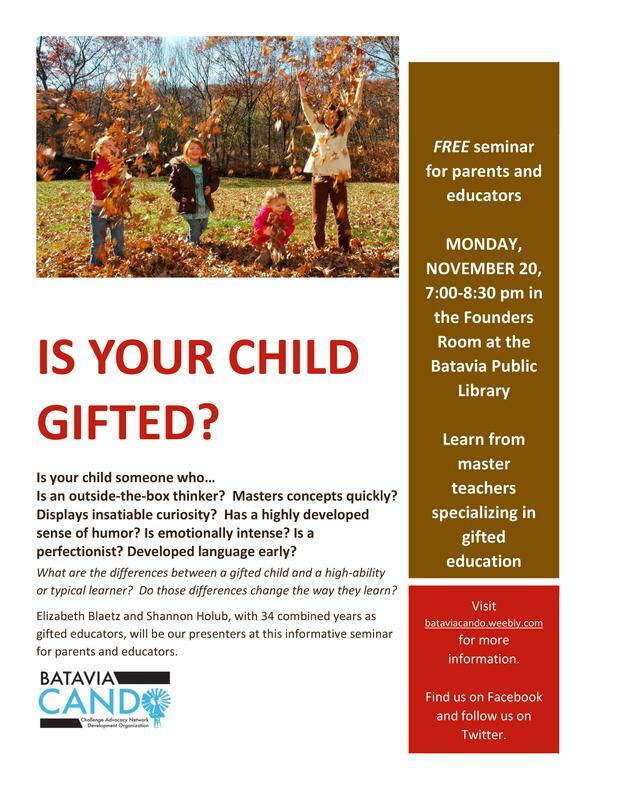 Welcome to Batavia CANDO, a parent-founded group for gifted and high-ability students and their families in BPS101. CANDO provides support, educational opportunities and district-level advocacy benefitting Batavia's educators and families . We endorse a district-wide learning plan for all students to reach their full learning potential. We want BPS101’s reputation to grow as a model of excellence in public education. Good question! CANDO has disappeared from the Batavia landscape. It is waiting for YOU, and parents like YOU, to step into positions on CANDO's Executive Board. For over a decade, CANDO has been the source for ideas and advocacy that benefitted Batavia's gifted and high-ability students K-12. CANDO is the only Batavia Interschool Council member group that does not charge a membership fee. 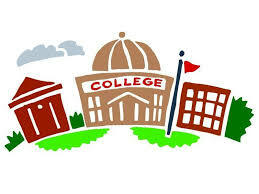 CANDO cannot solicit membership via BPS101 (because student participation in high-ability (gifted) services is determined by MAP test scores, BPS101 will not release participants' parent contact information to CANDO; and in recent years BPS101 has not been willing to facilitate introducing parents of newly identified gifted students to CANDO). Enrichment services for gifted students in grades K-2. If you would like these services to continue, and you're interested in knowing more about what CANDO's vision for the future of gifted (high-ability) services in BPS101 included, please contact CANDO at bataviacando@gmail.com. Our tradition continues...nominations are now being accepted for teachers and other BPS individuals who go above and beyond to provide enriching opportunities for our gifted learners. All BPS families are invited to participate in the nominations process--parents and students may submit nominations. Feel free to share this link/nominations opportunity on social media and invite others to participate in this wonderful Batavia CANDO tradition. Recipients of this year's Exemplary Educator Awards will be recognized at an awards reception and at the BPS Board of Education Meeting on May 15th, at 7 p.m. Traditionally, at the end of the school year, CANDO sponsors the Exemplary Educator Awards recognizing BPS101 professionals who go above and beyond to meet the unique needs of gifted learners. This year, CANDO is operating with several unfilled Executive Board positions, which has made offering many of our traditional programs a challenge. I am happy to take the lead on authoring and distributing the on-line nominations survey, securing the Board of Education meeting awards recipient presentation time, and helping to organize the awards reception prior to the BOE meeting where the EE Awards are presented. However, I need the help of 3-4 parent volunteers to host the reception and present the awards. Of course, I’d also love to have you join me at the BOE meeting where the Awards recipients are presented to the School Board members. Please consider volunteering to help with the Exemplary Educator Award reception. I’d love to see this CANDO-established tradition continue. "live" format for students and families. If CANDO is able to offer a modified version of this seminar in the near future (with BHS alumni at highly-selective colleges joining us for Q & A in an e-meeting format), we'll send out a new seminar date/time. Thanks everyone for your expressed interest. It is with regret that we must cancel the seminar at this time. Enjoy the Winter Break. The Accelerated Placement Act (SB 1223) is now law! The Accelerated Placement Act (SB 1223) has also been signed into law by Governor Rauner! The Accelerated Placement Act is an important piece of legislation and a major victory for students throughout Illinois. The law demonstrates our state’s commitment to helping all students reach their full potential by providing access to appropriately challenging learning opportunities. Beginning in July of 2018, all school districts should have fair and equitable policies allowing eligible students to access accelerated placement, which includes early entrance to kindergarten or first grade, individual subject acceleration, and whole grade acceleration. IAGC is in the process of developing sample policies and procedures, acceleration resources, workshops and other professional development opportunities for educators as districts work to adopt and implement their accelerated placement plans. IAGC will also provide information and support for families wishing to learn more about acceleration. Be sure to visit our website and follow IAGC on Facebook as updated resources are released. IAGC is grateful for our partnership with the Untapped Potential Project in organizing the research, policy, and advocacy resources needed to pass this legislation. We couldn’t have accomplished this without you! Thank you to all the legislators who championed this bill: Chief Sponsors – Sen. Lightford and Rep. Lilly; Chief Co-Sponsors – Sen. Weaver, Sen. Koehler, Sen. McConchie, Rep. Pritchard, Rep. Fortner, and Rep. Wallace; and Sponsors – Sen. Rezin, Sen. Bush, Sen. McConnaughay, Sen. Martinez, Sen. Harmon, Sen. Hunter, Rep. Sauer, Rep. Harper, Rep. Willis, Rep. Kifowit, and Rep. Riley. With this law, you have created powerful opportunities for high-ability students, including those from low-income, diverse, and rural backgrounds, to access learning environments that match their needs and change their academic trajectories. We extend another heartfelt thank you to our members and supporters for your help in getting SB 1223 through the Illinois General Assembly and to the Governor’s desk this summer. Your advocacy efforts made this possible! IAGC thanks all of you for making a difference for Illinois students! Encourage your friends to become members of IAGC and join our efforts! The School Code which requires school report cards to include the most current data collected and maintained by the State Board of Education will be amended. The State Board must now include, in the school report cards, certain demographic information concerning gifted education and advanced academic programs, as well as information concerning the number of teachers in a school who hold a gifted education endorsement. Your support helped HB 2461, the Report Card Bill, pass both the Illinois House and Senate. On Friday, August 25, 2017 Governor Rauner signed HB2461 into law. Advocacy works! How will the new law affect gifted students in Illinois? It will encourage schools to identify gifted and academically advanced students and ensure that able students do not miss critical opportunities to develop to their full potential. The new law will provide essential information to allow policymakers, researchers, and school leaders to effectively address Illinois’ excellence and opportunity gaps. It will identify effective local practices to help spread innovative models statewide making use of data that ISBE and local districts are already collecting. IAGC thanks you for making a difference for Illinois students! Membership matters! Your help is needed to keep the momentum going. If you wish to contact CANDO, please direct inquiries to ﻿BataviaCANDO@gmail.com﻿ or use the contact form below to be added to our email list. Thank you! 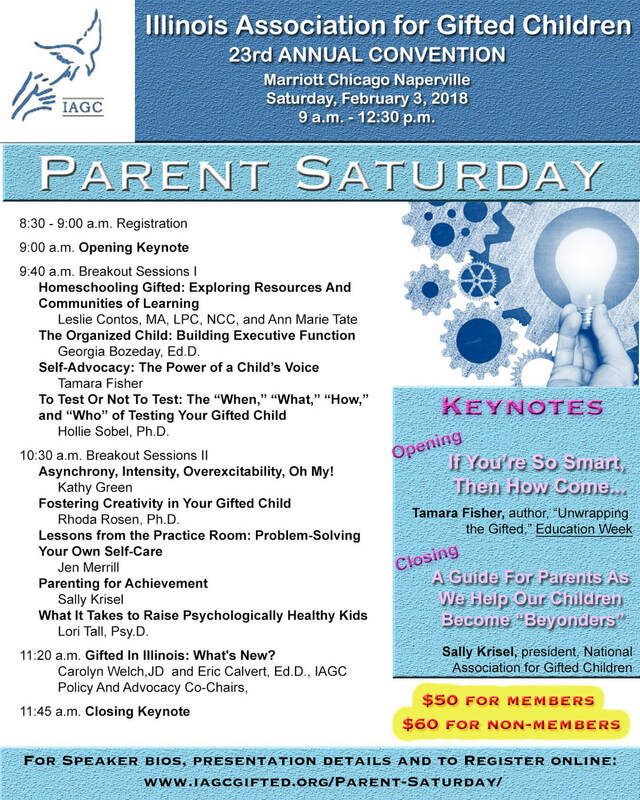 The 23rd annual convention will be held at the Chicago Marriott Naperville February 1-3, 2018.